Apple once had an enviable track record with reliability, but these days it seems they can't come up with a new PowerBook without something going wrong. In the case of their most recent models, those problems include lines in the display, sound problems, and underperforming SuperDrives. Add to that the RAM slot defect covered last week, and we're hoping against hope that the MacBook Pro will emerge unscathed by Apple's recent spate of 'Book gremlins. In other news, the MacBook Pro's battery life is apparently going to be at least as good as the 15" PowerBook. General Apple and Mac desktops is covered in The Mac News Review. iPod news is covered in The iNews Review. News about Apple's transition to Intel CPUs and other Intel developments is covered in The Macintel Report. "Apple is having some serious, documented issues with the 15-inch PowerBook G4s that were released in October 2005 (a.k.a. 'High-Resolution' or 'Double-Layer SD') and it appears that they are ignoring them. There are issues with PowerBook (and Mac mini) SuperDrives being unable to burn DVDs at more than 2x regardless of the media used...."
"Apple's latest PowerBook G4 seems to have a glitch which causes an intermittent audio echo/loop. "Although the gear is jolly nice to look at, the loop, which is emitted from the internal speakers and the line/headphone out jack, makes listening to the thing a bit uncomfortable. "According to a new site called powerbookdefect, the problem seems to occurs on the high-resolution 12, 15 and 17-inch models." "When the PowerBook first launched fifteen years ago, Macintosh laptops became 'real' computers instead of merely being toys bearing the Macintosh logo. But at every point along the line, PowerBooks have always been a step or two (or five) behind their desktop cousins. To own a Macintosh laptop, you've always had to make (usually significant) concessions on both speed and functionality. It's become less immediately noticeable in recent years because the whole platform has been moving forward so quickly, but the gap between desktop Macs and Mac laptops has remained nonetheless - until now, that is." "To the Mac geeks out there, I encourage you to consider this: the name change wasn't made with you in mind. You're important to the community, but Apple knows that it could have called the new laptop 'Sugarboat Banana Pops' and you guys would still have gravitated toward it. No, this name change was made for the non-geeks...."
"There have been several folks scratching their heads at Apple's 'no comment' during the Expo when it came to the MacBook Pro's battery life. Was it because there was some kind of bad news coming, or was it simply because the company hadn't had the chance to test the battery life in enough detail to certify its official lifespan, and didn't want any preliminary (read: incorrect) info out there in the meantime." "Suddenly, an actual use for a second monitor has presented itself to me, and it'll definitely influence my purchasing decision next time around." "Laptops need a boost.... The Core Duo (branded Centrino Duo when bundled with other Intel chips) follows the lead of the Pentium D desktop chips released last year, squeezing two processors onto a single piece of silicon. "Battery life is a mixed bag...."
PR: Red Hat , the world's leading provider of open source to the enterprise, today formally announced its founding corporate membership in the One Laptop per Child (OLPC) initiative. The OLPC project aims to create and distribute inexpensive laptop computers to students around the globe for educational purposes, particularly those in developing countries. Red Hat is focused mainly on the software aspects, and plans to drive the development of the operating system for the OLPC machines. The company's design plans also encompass larger issues of open source community participation, training, support, providing updates, certifications, and integrating additional technologies over time. Initially started as a research project at MIT Media Lab, and formally announced at the World Economic Forum at Davos, Switzerland in January 2005, the OLPC initiative has grown to include an elite group of contributors standing shoulder to shoulder to bring modern tools for learning to children around the world. "At Red Hat, we believe that open source technology can change the world, and is still in its infancy. It's a guiding principle that is embodied in everything we do," said Matthew Szulik, chairman, president and CEO of Red Hat. "Beyond a founding corporate sponsorship, we've put engineering and other strategic resources behind the One Laptop Per Child initiative to add our expertise, global reach and focus to the project. It's another real-world example of our mission to democratize technology, while helping to make knowledge and education more available for children everywhere." "Red Hat's experience and core strategy of open collaboration made them a natural fit with this project," said Nicholas Negroponte, chairman and Cofounder of MIT's Media Lab. "Open source and Linux will both reach and engage people in the rest of the world." Red Hat first embraced the OLPC project when Nicholas Negroponte, the chairman and cofounder of MIT's Media Laboratory, expressed an interest in making the laptop based on open source software. Using an open source software platform is critical to the success of the OLPC initiative, to both encourage local participation in the software projects, and to to allow students to customize and expand their machines as their learning needs and skills grow. According to the MIT Media Lab, the proposed $100 machine will be a "ruggedized" laptop, approximately the size of a textbook, featuring a Linux-based system with a dual-mode display. The laptops will have wireless broadband that allows them to work as a mesh network - each laptop will be able to "talk" to its nearest neighbors, creating an ad hoc, local area network. The laptops will also incorporate innovative power structures - including wind-up - and will be able to do most everything that "fat" clients can do, except store huge amounts of data. Nicholas Negroponte will discuss the OLPC initiative and Red Hat's role at this year's Red Hat Summit on June 2 in Nashville, Tenn.
"This battery firmware update is required for PowerBook G4 (15-inch Double-Layer SD) computers. You will find instructions below on how to determine if your PowerBook requires this update. This firmware update is required to keep your battery life up to specification, may recover battery life in some batteries that have developed short run times, and in some cases can recover batteries that are not recognized by the system. "To run the firmware update, your PowerBook needs to be plugged in to AC power. The update may take up to 15 minutes to complete." "We've all been frustrated with the lack of top performing CPUs in the recent G4 PowerBooks. Apple's answer is to switch to the Intel 'Core Duo.' Daystar Technology has another solution: upgrade your PowerBook's G4 CPU to run as high as 1.92 GHz. "We sent our 15" Aluminum G4/1.5 GHz PowerBook to Daystar to be upgraded. Although we were hoping for 1.92 GHz, our PowerBook could only achieve 1.83 GHz. But if you have a 1.33 GHz or 1.5 GHz PowerBook, you'll welcome any increase in speed." PR: Newer Technology Inc. (NewerTech) has introduced the NewerTech Clean and Polish Kit, engineered to remove scratches, restore color, and return original off-the-shelf shine to Apple iPods, iBooks, and all high quality plastic technology products. Each easy-to-use, three-component kit literally makes plastics look like new again and includes a specially formulated Heavy Scratch Remover solution, Fine Scratch Remover solution, and Plastic Clean and Shine protection polish. A valued-added free polishing cloth and step-by-step instructions are included. Packaged in three convenient, long-lasting one-ounce application bottles, all NewerTech polish components are nontoxic and nonflammable, ensuring safety to iPods, iBooks, and users. The NewerTech Clean and Polish Kit utilizes advanced chemistry bonds to remove heavy scratches, abrasions, fine marks and delicate cuts from virtually all plastics and acrylic surfaces without unsightly filling. The scratch remover elements also restore faded and discolored plastic. A state-of-the-art, Level 3 plastic polish leaves a lustrous shine that resists fogging, repels dust, resists fingerprint marks, and eliminates static. Retailing at NewerTech.com, through source distributor Other World Computing at www.macsales.com and (800) 275-4576, and through fine technology retailers and resellers, the NewerTech Clean and Polish Kit is priced at $17.99. PR: One of the lightest and most compact business rolling cases available. 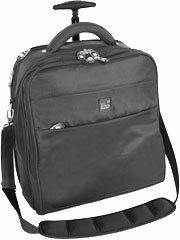 Full-featured organization, protection and easy-access storage, including two places to store your laptop. In addition, it features a 2-position single arm trolley handle, removable cable storage pouch and optional shoulder strap. Even compact enough to fit under most airline seats. Travel smart, travel lite! Meets all international airline carryon requirements. Fits all 15" laptops. Dimensions 7.5" x 16" x 14.5"
Maximum Laptop Size: 2" x 13.5" x 10.5"